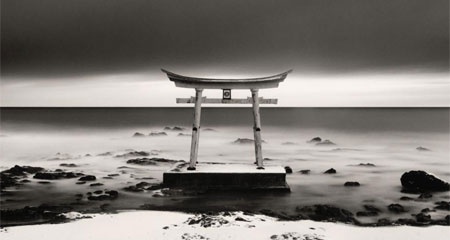 The name of Michael Kenna is usually associated with landscape photography. But there is such a mystical aura about his landscapes that they seem to be much deeper than just flat rectangular images. They resemble gentle ink or watercolor paintings, as if they contain the whole essence of the place they were taken in. No matter whether these photos are of the French provinces, Japanese gardens, American car factories, St Petersburg sculptures or Venetian canals, they are of regular format 8 by 8 inches. Black and white. Selective focus. Deep shadows. Misty and mystical. Minimalistic. Evocative. Using literary language, one could say his works are haiku rather than full-length prose. Kenna himself says that he prefers the “power of suggestion over description”. “We are part of the landscape and the landscape is part of us,” Kenna says. And one of his basic principles in photography is first to get acquainted with a place, to have a conversation with it, get its permission for a shot or maybe return there a second time with a new approach. His favorite time for work is the early morning, dusk or even night, then Kenna uses exposures that last up to 10 hours. The film in this case accumulates the time and events, things that are impossible for the human eye to take in. “When you make four-hour exposures in the middle of the night, you inevitably slow down and begin to observe and appreciate more what’s going on around you. In our fast, modern world, it’s a luxury to be able to watch the stars move across the sky.” And probably that is how his philosophy gets sealed inside his pictures. Michael Kenna was born in 1953 in a small industrial town called Widnes in Lancashire, England. He studied at the Banbury School of Art. A talented student in painting, Kenna nevertheless preferred photography over visual arts as it gave him a more stable income. At the London College of Printing he studied advertising, photojournalism, fashion and reportage photography, printing and even engraving techniques. Among the photographers who influenced Kenna immensely and inspired him for fine art photography at that period he mentions Brandt, Sudek, Stieglitz and Sheeler. Kenna graduated from the London College of Printing in 1976 and started to work in advertising in London, through photographing the landscape for his own pleasure. In 1977 he moved to the USA and through the Stephen White Gallery got acquainted with Ruth Bernhard, a fine photographer and another great inspiration for Kenna. She taught him the printing which opened him up new interpretations and freedoms. 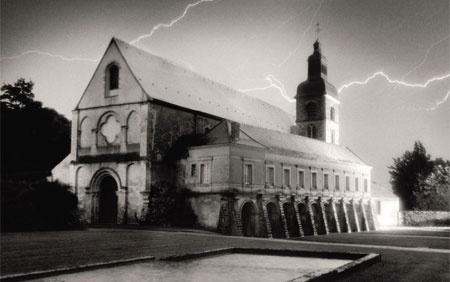 Nowadays he is a guru of modern photography, with his works displayed in about seventy museums all over the world, including the National Gallery of Art in Washington, Victoria and Albert Museum in London, and the Museum of Decorative Arts in Prague. More than 30 books dedicated to his art and scheduled exhibitions from Los Angeles to Moscow. The Moscow exhibition is his biggest retrospective ever presented in one museum. More than 300 prints from different series over the years: France, Japan, USA, Monique’s Kindergarten, Venice are on display. Before the Moscow show Kenna had plans to go Siberia—a place he had long ago dreamt of photographing. So who knows, maybe it is the beginning of a new refined, out-of-time Kenna project.